The visual system is a beautiful, complex system that allows us to enjoy and explore the world around us. However, when not working properly, this delicately balanced system can also hinder development and academic performance in children. 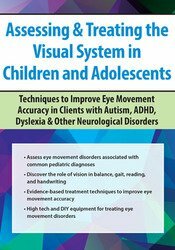 This recording introduces the components of the visual system and their interactions in pediatric motor and academic skills. Explore common visual system problems that can limit the progress and potential of pediatric patients with autism, neurological disorders, and ADHD. Gain the skills necessary to assess visual problems and practice these skills during the recording. You will explore the treatments of common vision-related problems, including evidence-based treatments and real-world examples, increasing confidence in your own practice abilities. In addition, you will learn to use the visual system as a tool to improve gait and balance. Master treatment ideas that can be used immediately and effectively in your practice to improve outcomes in your young patients. Robert Constantine, OTR/L, is an occupational therapist with nearly 20 years of experience in the fields of visual and neurological rehabilitation. Mr. Constantine is employed by the Pearl Nelson Child Development Center, where he focuses on the treatment of eye movement disorders in neuro-typical and special needs children. Mr. Constantine’s passion leads him to intensive studying of the visual system and continuous searches for new ways to improve patient outcomes. He is a member of the Neuro-Optometric Rehabilitation Association, a unique interdisciplinary organization that brings together the tools of optometry, occupational and physical therapy to improve outcomes for patients with neurological diagnoses. In addition, he is the only occupational therapist to be a member of the High Performance Vision Associates, an elite group of sports vision optometrists. As such, Mr. Constantine has participated in sports vision screenings at IMG Academy, Hendricks Motorsports, and on the LPGA tour. He has also developed and marketed drag-racing specific glasses that have been successful in NHRA Sportsman drag racing, as well as having worked with elite NHRA racers, golfers, and sporting clays champions. Financial: Robert Constantine has an employment relationship with Pearl Nelson Center. He receives a speaking honorarium from PESI, Inc. Non-financial: Robert Constantine has no relevant non-financial relationship to disclose. 6.0 ISBE Professional Development (PD) Clock Hours will be made available through Quincy University. Those requesting ISBE PD Clock Hours will need to complete additional steps in order to receive the ISBE “Evidence of Completion for Professional Development” form. Expires: 06/30/2019. PESI, Inc. is an AOTA Approved Provider of continuing education. Provider #: 3322. This self-study course qualifies for 6.0 self-study contact hours or .6 CEUs in the Category of Domain of OT and Occupational Therapy Process. The assignment of AOTA CEUs does not imply endorsement of specific course content, products, or clinical procedures by AOTA. Course Level: Intermediate. Expires: 11/12/2020. NCBPTE approval by virtue of approval by The New York State Education Department, Office of the Professions, State Board for Physical Therapy licensure board or state APTA chapter Approval good through .